The manufacturing industry has historically been based around manual packing and hand labelling. These processes are highly labour intensive and in today’s economic climate can have a huge effect on ongoing costs. Manual handling invariably involves a group of operators huddled around the outfeed of a production line, each packer taking one or more products and packing them individually into an outer case. Alternatively, a Lazy Susan may be installed. Neither solution really optimises efficiency. A recirculator is by far the most efficient way of packaging your product in to outer cases. 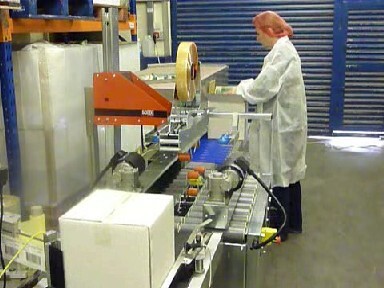 Increases through put as the packers are not moving too and from picking area to the packing area. Reduces your energy usage. Our recirculator uses DC motors and goes into standby mode when product is not present, bringing significant energy savings. Takes up less space than a Lazy Susan meaning that this machine can be successfully incorporated into most production lines, enabling you to benefit from these cost savings. Reduces the risk of injury to the packers caused by repetitive movements the operative stands directly in front of the recirculator and as close to the products as possible. Products are pulled and lowered, keeping movements to an absolute minimum, eliminating the adverse effects of twisting and bending, and reducing back strain.